What do you do with those seeds from your acorn squash recipes, have you been throwing them away? I hope not… because I have a delicious new way to use those seeds! How about using them in your cookie recipes? I wasn’t really sure what to expect but from now on I will always save the seeds from my squash. Since starting this food allergies diet I have removed peanuts, hazelnuts, sesame seeds, sunflower seeds and just about all nuts from my diet. I was curious as to how I could use the seeds from the acorn squash as I love to make acorn squash soup and I like to use as much of the squash as possible to prevent waste. I found out that they are edible so of course my first thought was how can I make this as a cookie? See how below. Take the cleaned and lightly dried seeds and place onto a piece of foil and lightly spritz with canola oil. Place into the oven and bake for 10-15 minutes. Once the seeds are done place into blender (I used a magic bullet blender) along with ¼ cup water, 1 tbl brown sugar, 2 tbl canola oil, vanilla and a pinch of salt. Pour seed mixture into flour, I like to add remaining 1/2 cup water into blender swish around then pour into bowl to get all of seed mixture. 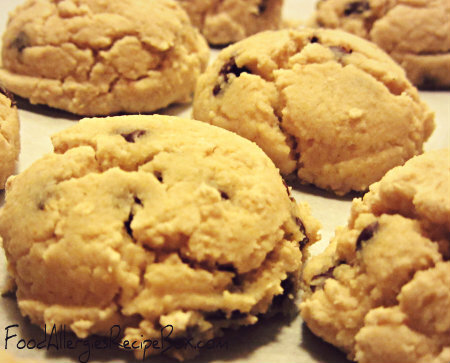 Mix together, ingredients should form into dough, and mix in optional chocolate chips. Line baking sheet with parchment paper, using a tablespoon, scoop out cookie dough and place onto baking sheet. 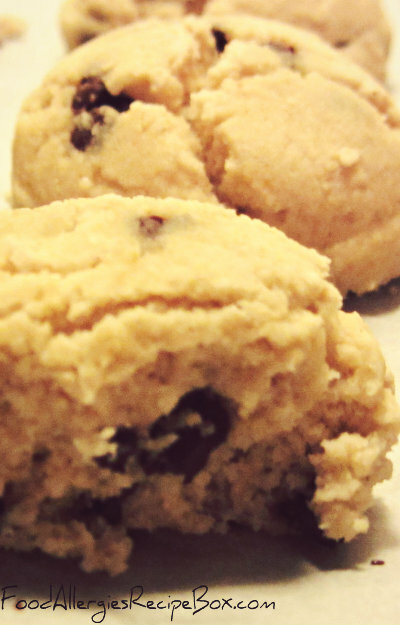 I left the cookie dough in the dome shape from the tablespoon, you can also flatten. If you enjoyed this acorn squash recipes and want more cookie recipes, click here to see more cookie and dessert recipes! Return from Acorn Squash Recipes to Food Allergies Home Page!